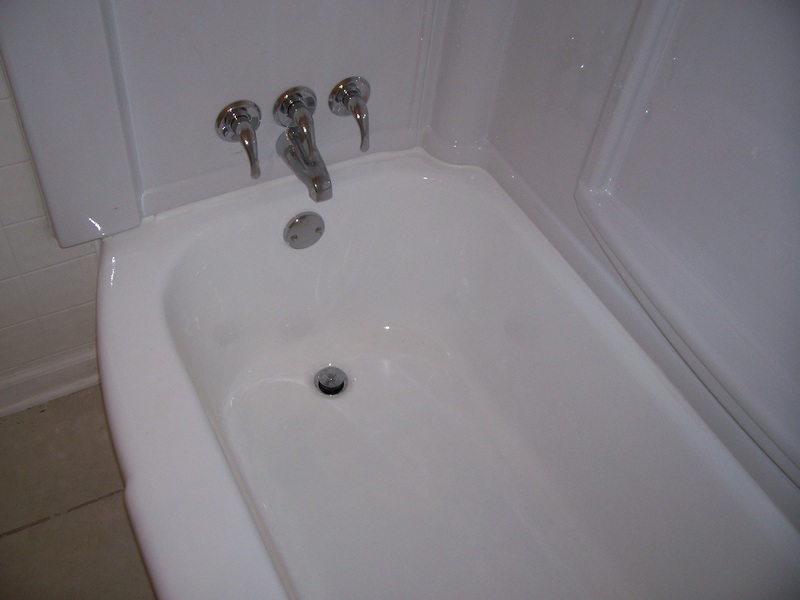 We Specialize in all kinds of repairs on fiberglass tubs and full refinishing of bathtubs, sinks, tile walls, tile floors and more. We will be happy to stop by to give you a FREE ESTIMATE and explain our process. We start by removing hardware as necessary and repairing any chips or cracks in order to leave you with the smoothest finish possible. We then thoroughly clean the surface and use a chemical etching solution to microscopically prepare the surface to have the strongest bond between the surface and the coating. After the tub has been rinsed and dried, the surfaces get masked off with plastic film and masking paper. This ensures a tight clean edge with no overspray where it shouldn't be. Once the area to be sprayed is properly cleaned, etched, rinsed, dried and masked off, the primer is mixed together and gets sprayed on. Two coats of primer are applied after which we mix up your color of choice. White is by far the most often picked color, however, Off-White, Grays and even some neutral Tan colors are not uncommon. Using techniques learned over many years, we apply 2 to 3 coats of the topcoat in a spray pattern that leaves the final surface glossy, smooth and looking NU AGAIN. During the spraying process, our ventilation system removes the overspray and smell out of the room and blows it outside through a nearby bedroom window. The doorway is also taped off with plastic. Even with these systems in place, there may still be a slight odor which will dissipate within a short amount of time. Due to the nature of your bathroom not being a highly controlled area, it is not uncommon to find tiny bits of dust caught in the coating. This is not a reason for worry. 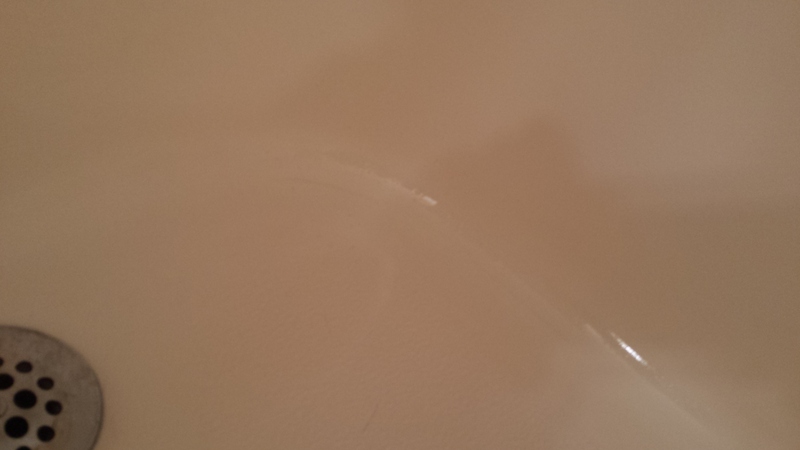 We will return the next day to buff your new surface to a highly polished and glossy finish. When we leave your home we will make sure we leave our work area cleaned up. All our equipment, tools and trash will be removed. At this point feel free to admire the work that was done, but please do not touch it. After spraying, the surface needs to cure for 24 hours before use. When we return to buff the surface, we will also re install any hardware that was removed. You will have a new finish that can last for years with proper maintenance. The most important thing is to NOT use any abrasive powders or corrosive cleaners. Using these types of products will dull the shine and wear away the finish. 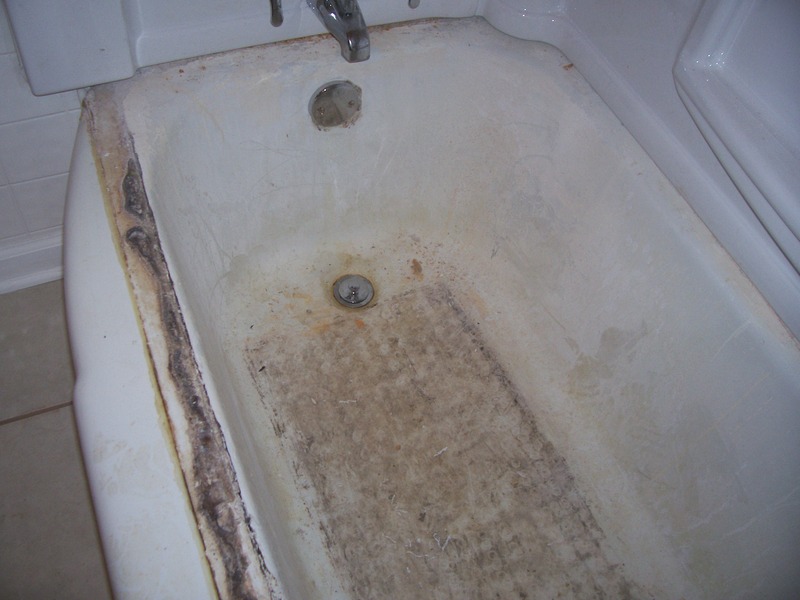 Any type of mild tub and tile cleaner is always safe to use. It is also NOT recommended to use a bathmat with suction cups. These suction cups trap soapy contaminated water that cannot rinse away. Over time this trapped contaminated water can slowly eat away at the finish allowing for eventual water intrusion leading to chipping and peeling. If a bathmat must be used, please use those that do not use suction cups. 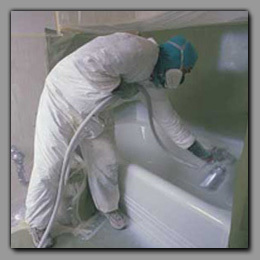 We can also do almost any kind of repair on your fiberglass tub. Whether you have a small chip, a hole or the bottom is cracked through, we can help. 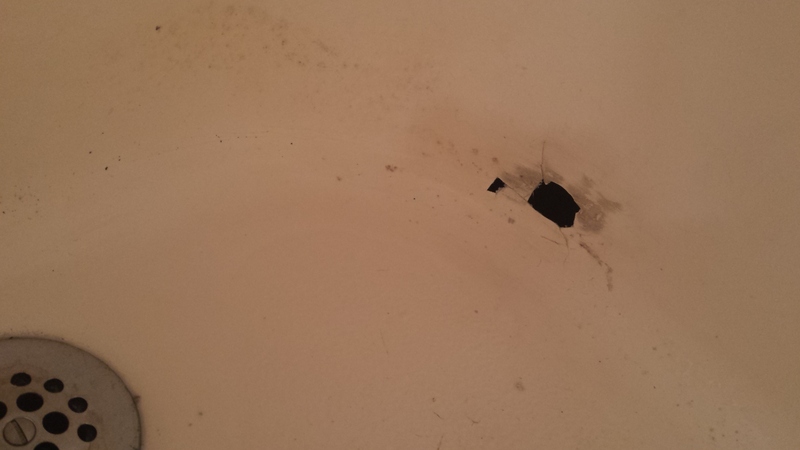 The hole or crack is filled in and sanded smooth. Then the area is wiped down and cleaned. Finally we spray on a topcoat, blending it in to the existing tub surface. We have a high degree of accuracy in matching colors to ensure a high quality repair. Please call us for a FREE ESTIMATE and we would be happy to tell you what we can do.